Here are flyers, posters, pamphlets, web banners, and any other graphics that may be useful to others. We also have web graphics for you to embed on your site! Please use, share, and remix these! Want to submit your own? Upload them to the LibrePlanet wiki. 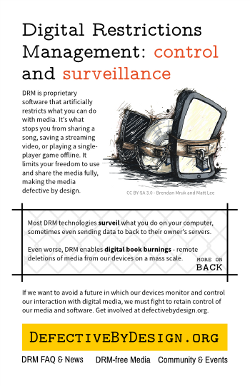 A brand new half page flyer on how to be DRM-free! 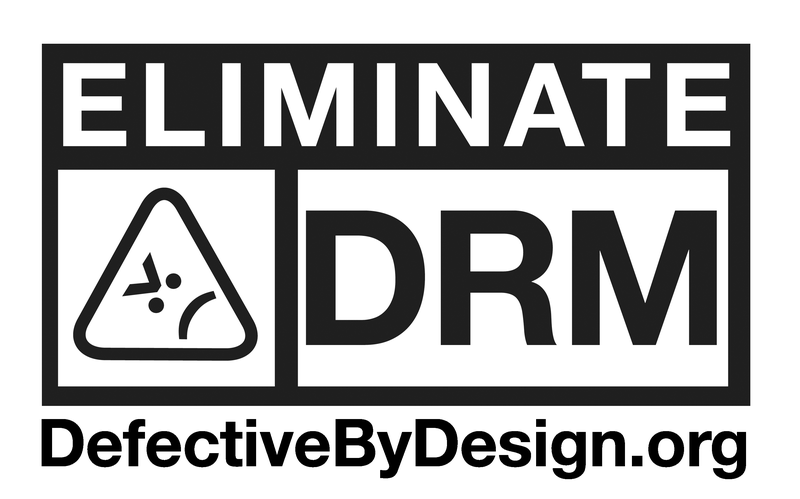 Our half-page flyer introduces DRM and Defective by Design. Also available in other languages: Suomenkielinen, français, română, русский, español, Türkçe. Don't see your language? Get started translating! "What Is Digital Restrictions Management?" Full Page Flyer This PDF is a one page letter-sized flyer (8.5 x 11). "Paper vs DRM ebooks" Full Page Flyer This PDF is a one page letter-sized flyer (8.5 x 11). "Richard Stallman's printed vs ebooks" Full Page Flyer This PDF is a one page letter-sized flyer (8.5 x 11). "What Is DRM" Leaflet This PDF leaflet is letter sized with two side by side (4.25 x 11). These PDFs are set up to work with Avery Labels (laser and ink jet), the number appended to the end of the file name signifies the label type. Note that the first 1 digit usually just refers to the type of stock for the label (laser, ink, transparent, high visibility).